Masters winner to pocket cool $2.07 million! 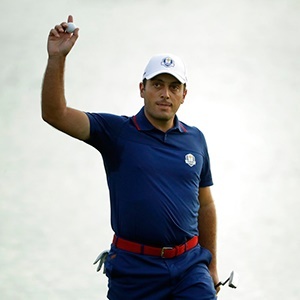 Augusta - Francesco Molinari won't be dwelling on his British Open triumph at Carnoustie last year when he tees off alongside Tiger Woods in search of a Masters title on Sunday. "I think, to be honest, every tournament is different and every time is different," Molinari said. "I think how I hit the ball tomorrow will help my comfort a lot more than thinking about Carnoustie. "I don't think I'll be thinking about Carnoustie a lot tomorrow." The Italian fired a six-under par 66 Saturday at Augusta National to stand on 13-under 203 after 54 holes, two strokes ahead of 14-time major winner Woods. Molinari, who previous best Masters finish was a tie for 19th back in 2012, has played without a bogey for 43 holes, and is the only player with two bogey-free rounds this week. Par-saving putts at the fourth and fifth and an up and down for par from a bunker at 18 were - for him - the highlights of a round that included six birdies. "Mentally was very good," he said. "I would say the more important shots were probably the two par putts on four and five ... you keep momentum on your side if you make them. If you drop shots there, then it kind of changes the whole round." Molinari also played alongside Woods in the final round at Carnoustie. This time around, the Italian goes in with a two-shot lead over Woods and American Tony Finau - who will also play in the last group as tournament officials send players off in groups of three in a bid to beat inclement weather. "He's obviously playing great golf," Molinari said of Woods. "So I'm aware it's not going to be easy tomorrow. But it's not like I can only worry about him. "We've seen (Saturday) that you can shoot seven-, eight-under the way the course is playing. "Obviously it's nice to be a little bit ahead, but you might just need one hole to change. You never know how it's going to go, especially around a course like here."